ALGIERS, ALGERIA — Today is a very long day of journey home. Last night after doing some errands in the market in Djanet I got to go back and do some more photography in the ksars, and we even got to visit the restored area, as Mohammed knew someone who worked for the association involved in preserving the location. He came and opened the locked gate for us and accompanied us, but we were free to explore and photograph all around the site. He told us a little history, and explained how the families from this ksar and the other one would consider each other as “outsiders,” so that if someone from the other ksar married into a family here, they would still be considered a “foreigner” in the community. While we were there I heard the call to prayer from the mosque down the hill, and I realized that I had hardly heard the call to prayer at all during my journey because we had been out in the desert almost the whole time. Later in the evening Mohammed invited me to his home for dinner together with Tagazou and Saghd, and they had their guitars and we had a few last songs as a team. They all accompanied me to the airport even though the flight left in the middle of the night, and the goodbyes were hard after almost two weeks of working so closely together in the field. The stars were still visible in the sky as we walked out across the tarmac to the aircraft, and I said a silent goodbye also to the Sahara. 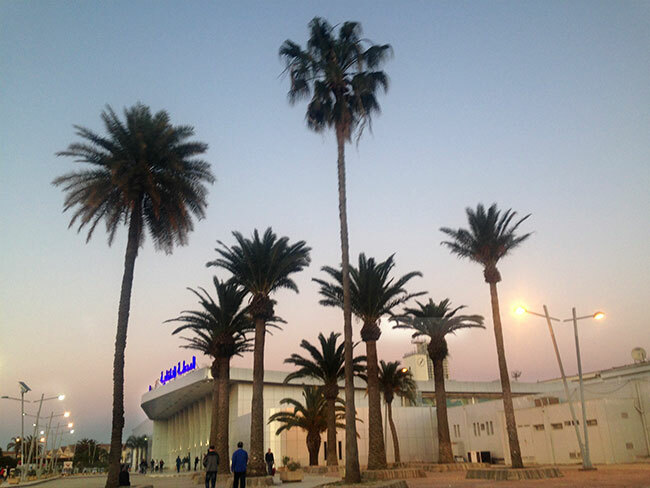 I arrived in Algiers airport early in the morning, with the first light, and took my time with the transfer as I had a long layover before the flight to Paris. Outside it was cold compared to Djanet, and I had all my layers on. Even something about the Algiers airport seemed beautiful in the pre-dawm light as I walked from the domestic airport to the international one next door. Then it was a long long wait until the next flight. I walked back and forth across the airport in search of nothing in particular. Eventually I settled into an airport cafe to wait and reconnect to the world via wifi.